February 25th, 2019 (7:01 PM). Edited February 25th, 2019 by DrFuji. From the results of the secret ballot in the nomination round, these are the hacks that have had the most votes in each category. Three judges have played each hack and rated it in four categories. The reviews and reasoning behind the ratings can be found in the thread here. The hack with the highest total of points from each category is the Hack of the Year! 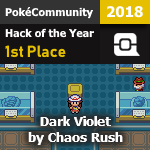 Dark Violet has won Hack of the Year, congratulations! Thanks to everyone for participating, and we hope to see you all next year! February 25th, 2019 (8:06 PM). 2nd place isn't bad. Thank you guys! Congrats to Chaos Rush. February 25th, 2019 (8:24 PM). Edited February 25th, 2019 by Delta231. 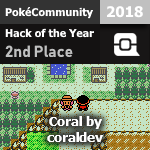 Well, Coral got 2nd in his early years of development which is quite awesome achievement for it as compared to other older hacks who are not able to become second even after getting nominated for years. I was sure that Dark Violent would be in the top for its quality. 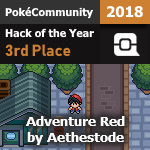 Adventure Red always get nominated but loses because of one reason or another. Well let's see what 2019 nominated hacks would be. Good luck to everyone! February 25th, 2019 (11:51 PM). congrats to the winners! massive effort thrown to their respective hacks. deserves every bit of recognition! February 26th, 2019 (1:04 AM). February 26th, 2019 (1:15 AM). I really liked how the judges gives their reviews for every hack that has been nominated, I do quite enjoy Dark Violet this year since it has been completed by both hacksrepairsman and Chaos Rush which is actually my favorite back then on 2014 seeing how it got recognition really made me want to celebrate and drink Coke. Now is the time to wonder which will win next year since the Decomp projects are starting to become a thing. Anyways congratulations also to Coral and Adventure Red! February 26th, 2019 (5:14 AM). Congratulations to Chaos Rush, Hacksrepairsman and Mrds. February 26th, 2019 (7:54 AM). I'm so happy to hear that Date Violet one. It was my favorite hack back in 2014 and the fact that it finally attained completion and a prestigious award in the Pokemon ROM Hacking community makes me wanna "Hip-Hop" around, hahah! Cheers to those who won as well as the contenders! March 12th, 2019 (12:48 AM). Edited March 12th, 2019 by Infinitum. ╭━━╮╱╱╭━� ��╱╱╱╱╭╮╱� �╱╱╱╱╱╱╱╱ ╱╱╱╱╱╱╱╱� ��╭? Another year, another instance of Adventure Red getting robbed. 4 Weeks Ago (5:14 AM). Edited 4 Weeks Ago by VisionofMilotic.